Play Secrets of the Stones slots for a magical adventure in Stonehenge! Trigger the Free Spins Bonus & get extra Wilds, Multipliers, more Free games, and Wild Reels! 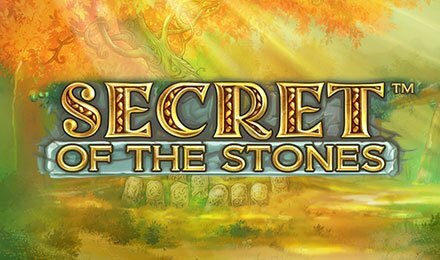 Secrets of the Stones slots is a mystical online slot with a Stonehenge theme and gorgeous Celtic style graphics! Go back to a time when the ancient Druids used to roam for magical winning opportunities. Try to get 3 or more Tree of Life Scatter symbols to activate the interactive Free Spins Bonus Round! In additional to 10 Free Games, you’ll get to pick stones to reveal extra bonus add-ons to boost your cash wins! Pick 3, 4, or 5 stone out of 20 to reveal extra free spins, additional Wild symbols, multipliers, and Wild Reels!